The 35 acre wood was formerly owned by the Harewood Estate and Harewood Sawmill. Up to its purchase by the Trust, it had been planted as a mixed conifer and broad leaf plantation for the production of timber. During 1990 the sawmill felled and extracted 20 acres of timber prior to the sale of the wood. The woodland was subsequently purchased by the Trust in 1993 and the felled areas were left to regenerate naturally from the cut stumps and seed-bank present in the soil. Underlying the woodland soils are two different rock formations. To the North and West, sloping down to the river boundary, are the Millstone Grits. To the southern and higher parts of the woodland the underlying rock is Magnesian Limestone, deposited in the Permian period circa 250 million years ago. Soils are acidic on the Gritstones, alkaline on the Magnesian Limestone and the fertile alluvium-based soils at the north-eastern boundary are derived from the deposits of the River Wharfe. The varied geology and soil types result in a diverse flora and fauna. Ox Close has several plant species that are indicators of ancient woodland. Some you may find are; Wood Sorrel, Herb Paris, Yellow Star of Bethlehem, Wood Anemone, Opposite-leaved Golden-saxifrage, Yellow Archangel, Small-leaved Lime, the grass Hordelymus europaeus and the sedge Carex sylvatica. The wood is an important site for the rare Thistle Broomrape Orobanche reticulata, found nowhere else in the British Isles except a few locations in Yorkshire. Due to its rich natural history, Ox Close is one of the most important deciduous woodlands in the lower Wharfe valley. Since purchasing the wood, the management has aimed to maintain and increase the variety of habitats for wildlife, to improve access and to make a wider public aware of the rich flora and fauna. As well as allowing the felled areas to regenerate naturally back to woodland, original rides have been maintained, new ones cut and glades created. Two and a half acres have been fenced and grazed by our flock of Hebridean and Soay sheep to create an area of woodland pasture. Our management allows areas for woodland-edge flora to thrive, providing a good source of nectar and suitable breeding and feeding habitats for grassland and woodland birds, mammals, butterflies and other insects. Some areas of woodland are managed as coppice, other are left to develop with minimum intervention. At the north-eastern end of the wood, a mixed Sycamore and Ask plantation is being thinned to allow a wider variety of tree species to flourish. This encourages a mixed age structure with an understorey scrub layer. The thinned wood is fired in our kilns to produce charcoal which is sold in the village shops and the profits used towards conservation management. The Trust hopes that all our efforts will result in a woodland richer in resident wildlife and will encourage colonisation by a wider range of species. The woodland floor and rides are carpeted with Bluebells, Yellow Archangel, Stitchwort, Wood Anemones, Ramsons, Cowslips, Primroses, and Dog’s Mercury. Also to be found are Yellow Star of Bethlehem, Alternate-leaved Golden Saxifrage, Few-flowered Garlic, and Herb Paris. Butterflies to look out for are: Orange-tip, Brimstone, Comma, Peacock, Small Tortoishell, Green-veined and Large Whites. As the woodland comes into leaf and the canopy closes, light is restricted to the woodland floor causing the ground flora to die back. However, the managed rides and open grazed area allow light into the woodland where Red Campion, Common Spotted and Bee Orchids, St John’s Wort, Common Centaury, Autumn Gentian and Thistle Broomrape may be seen. Butterflies to look out for are: Speckled Wood, Comma, Meadow Brown, Peacock, Large and Small Skipper, Gatekeeper, Ringlet and, if you are very lucky, the uncommon White-letter Hairstreak. This area of the Wharfe is excellent habitat for the damselfly; The Banded Demoiselle. Their body colour is metallic blue-green in the male and metallic green in the female. The male has a blue-black band across the centre of its wings and the wings of the female are an iridescent bronze. Is a good time to see the rich variety of woodland fungi. 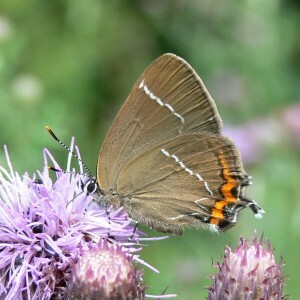 The Wildlife Trust produces a newsletter twice a year and organises regular events, conservation management work parties, natural history recording days and guided walks throughout the year.